I spent the day recently at Elizabeth Quay with my little girl and was amazed at how much it has changed and the amount of fun you can have with kids. 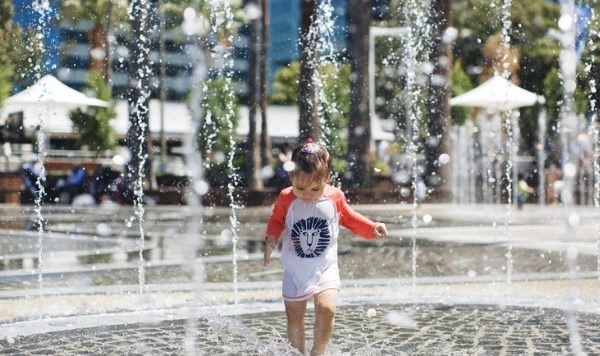 So whether it is school holidays or if you have pre-school aged children and need a morning of excitement, head down to Elizabeth Quay in Perth for fun-filled activities. 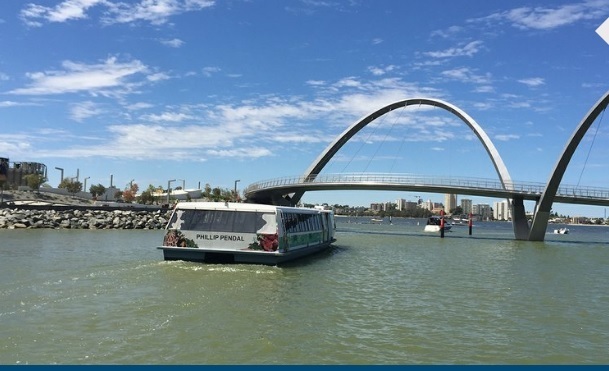 If you are not a fan of the city, crowds and cars you can even take the train or bus directly to Elizabeth Quay, bypass the hordes and just take in the Swan river view as if you were on a holiday. If you like, you can even park across the river at South Perth before catching a ferry across to Elizabeth Quay. You can even make a stop at Perth Zoo while you are at it. The first stop on a hot summers day should be the BHP Water Park, an interactive water feature with lighting and choreographed water jets designed to make your kids shriek in delight whilst simultaneously cooling them down. Located opposite the Elizabeth Quay Train Station, it is the primary entry point to Elizabeth Quay. During the day you can bring a picnic and enjoy the view. See if your kids can spot the colourful mosaic laid at the bottom of the water park called Pinjah, representing the Dreaming story of the creation of the Milky Way. The park is opened from Wednesday to Monday from 10am to 6pm and it closes on Tuesday. There may be temporary closures required from time to time as well. Check the Elizabeth Quay Facebook page for up to date information. Let your kids dry out at the island playground, a maritime-inspired playground with climbing ropes, frames to scramble, a sand pit, log steppers, a slide to enjoy and a ship's bell to ring. The playground is designed to encourage creative play and helps your kids remain active whilst having a ball. If you and your kids want to explore a larger boat, come aboard and explore the replica of the historic Duyfken – the Dutch barge and first ship to land on Australian shores in 1616. Built in 1999, take a tour of the Duyfken whilst it's moored near the island at Elizabeth Quay. If you are a historical buff and want to know more, take an audio tour which takes you on two journeys - one that walks you through the ship, its history and parts, with the other tour taking you on a step back in time 400 years to give an idea of what it was like aboard the ship in the early 1600's. Each guest will have their own audio kit. The full audio tour runs for 25 minutes, with plenty of opportunities for photographs at the end of the tour. If you don't have the time or if your kids have a short attention span there is also a short 10-minute tour available through the ship and an opportunity for you to take photographs. The epitome of a summers beachside holiday, hop on the traditional handcrafted Venetian carousel all the way from Italy (crafted by the same people who built the carousel in front of the Eiffel Tower). Admire the beautiful hand painted horses and carriages while your kids delight in the fun ride. The Elizabeth Quay Carousel is wheelchair friendly and accommodates 40-43 people each ride. Tickets available at the ticket box by the carousel during opening hours. If your kids still have energy left after all the previous fun-filled activities, they can try their putting skills in a fun 18 hole mini golf course. Nothing will make them happier than beating mum or dad in a game! The course is located on Lot 2, on the Western Promenade of the quay, opposite the Transperth Ferry terminal. After all the activities, everyone is bound to be tired and needing a feed. The Isle of Voyage is a relaxed family restaurant housed in the historic Florence Hummerston Kiosk. Enjoy fresh salads, woodfire pizzas, cakes, coffee or cold pressed juice in a scenic building.